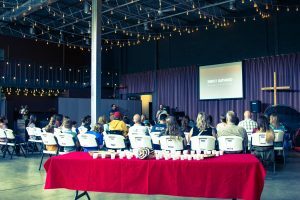 When 64 people gathered in the Pybus Public Market in Wenatchee, WA, on September 18 for the first regular Sunday gathering of Pacific Crest Church, there was more going on than the worship you could see. Johnathan and Dawnette Thomas had prayed about how to frame the start of this church. The idea of launch didn’t resonate with them, so they played with other themes before feeling God gave them the word “birth”. A new church was being brought into the world, not yet fully formed, but fully alive. It was the perfect analogy. And then, it wasn’t. Early in September Dawnette grew very ill and weak. She was miscarrying a baby. Johnathan wrestled with whether to postpone the service. He considered reframing the language of the day to steer away from a very personal and very painful topic. But he remembered that God had provided this wording. And so, even as the Thomases rejoice in birth of a new church, they mourn the loss of their child. They stand before their community and let God speak through their pain into the hearts of others who are hurting.